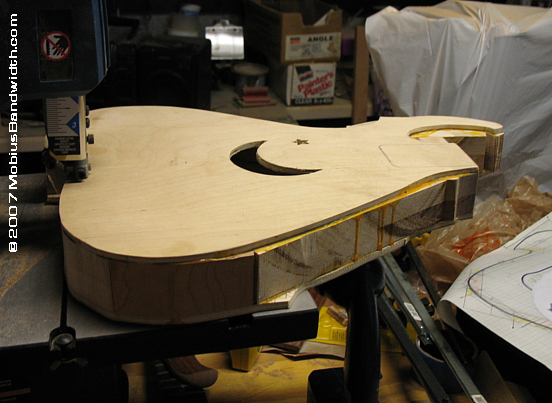 The word "Luthier" originally meant lute-maker, but now means any builder of stringed instruments, other than pianos. 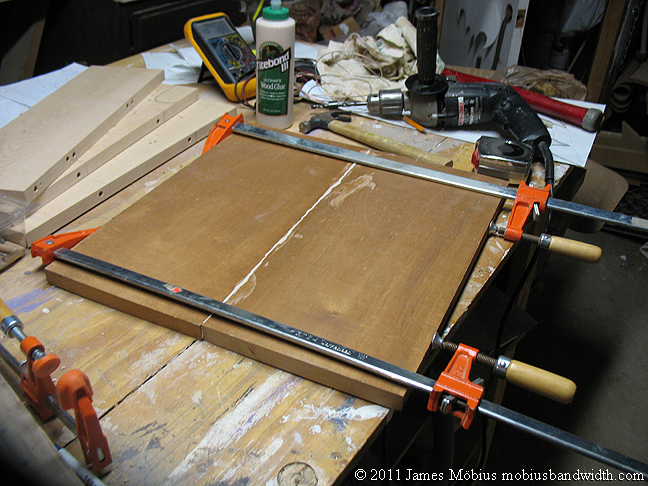 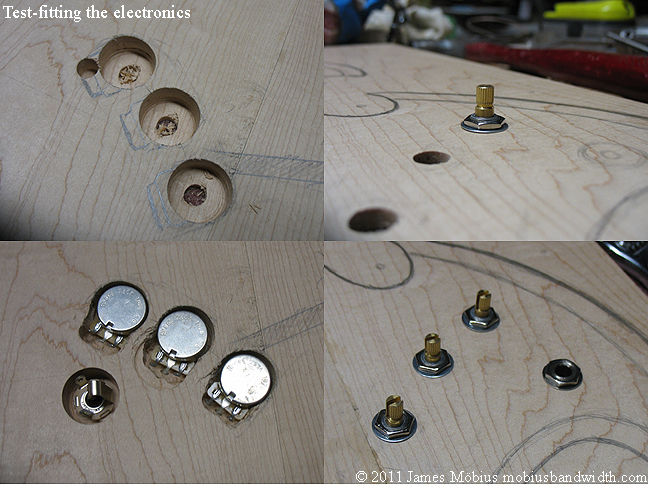 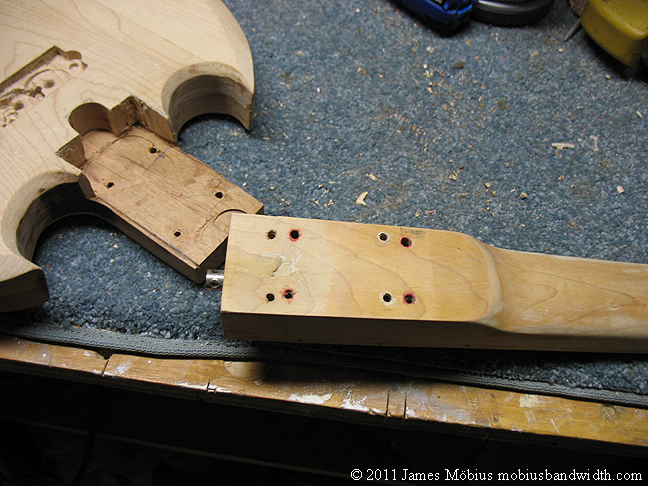 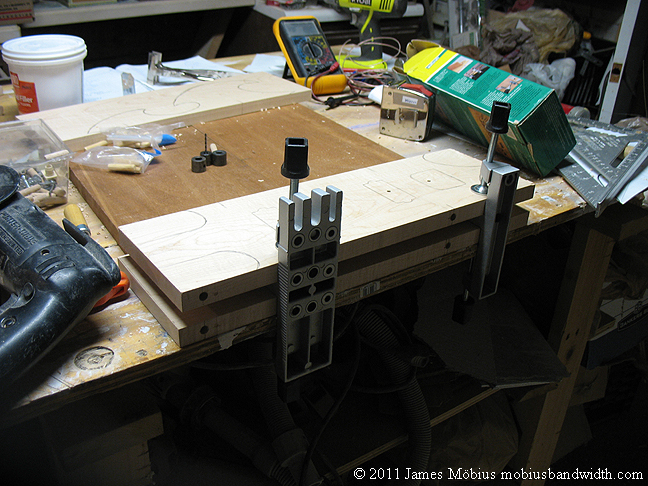 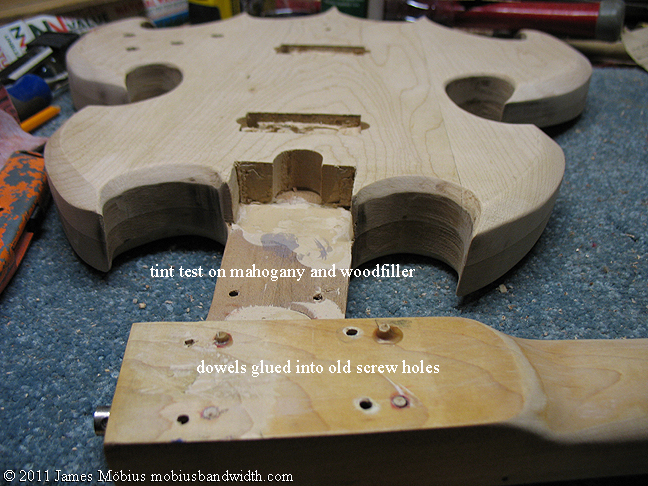 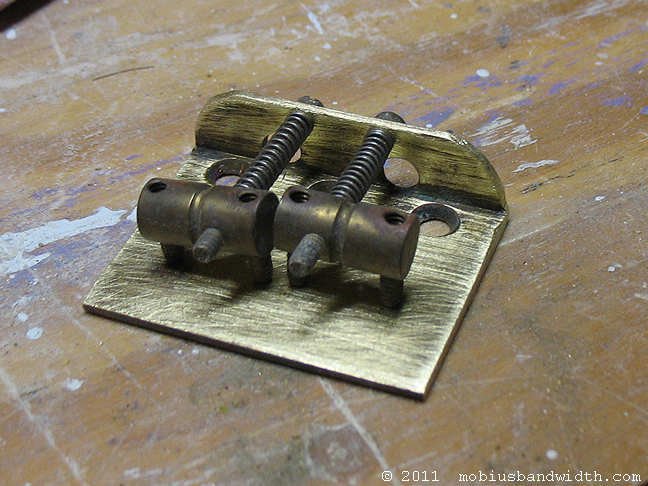 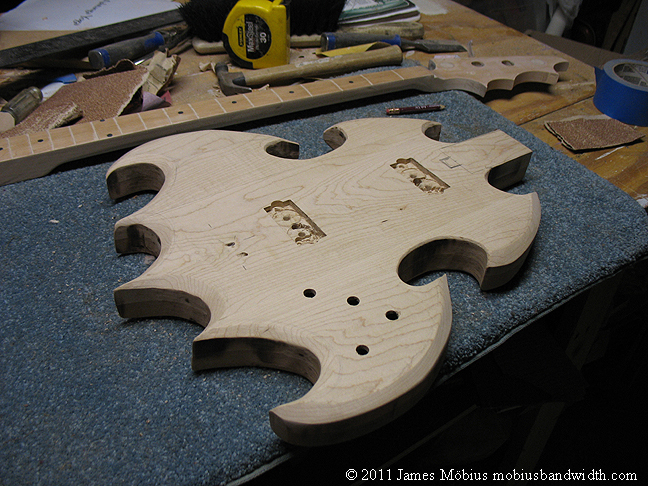 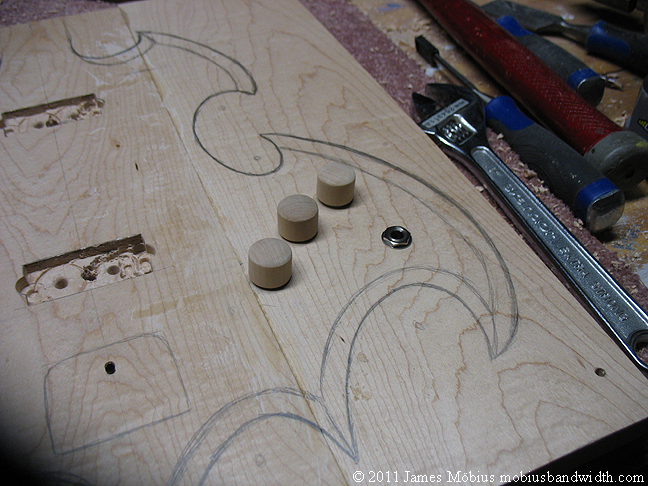 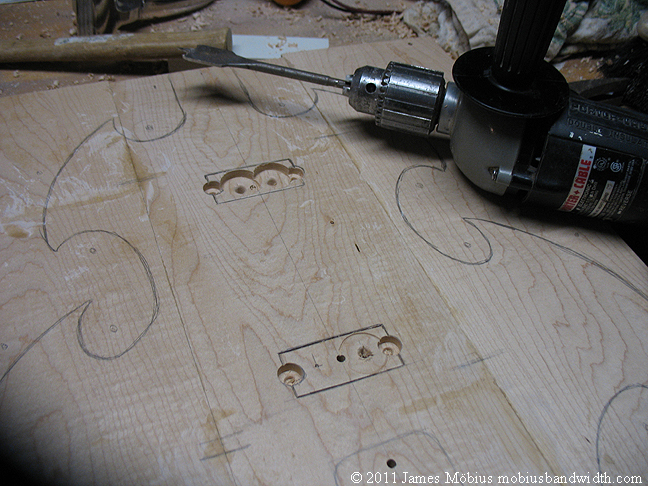 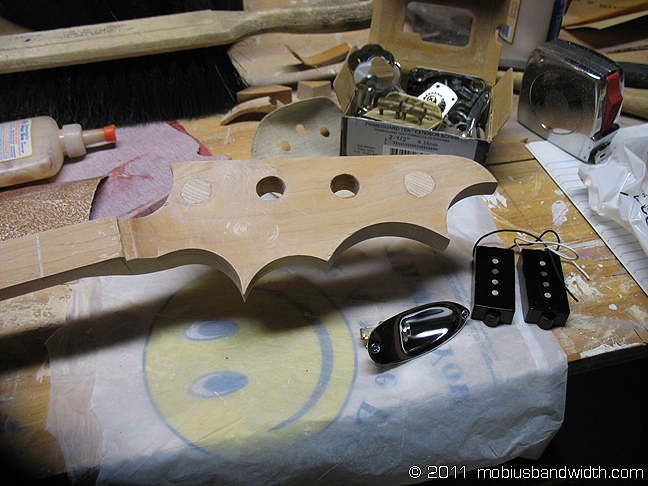 I've been modifying and building instruments almost for as long as I've been playing. 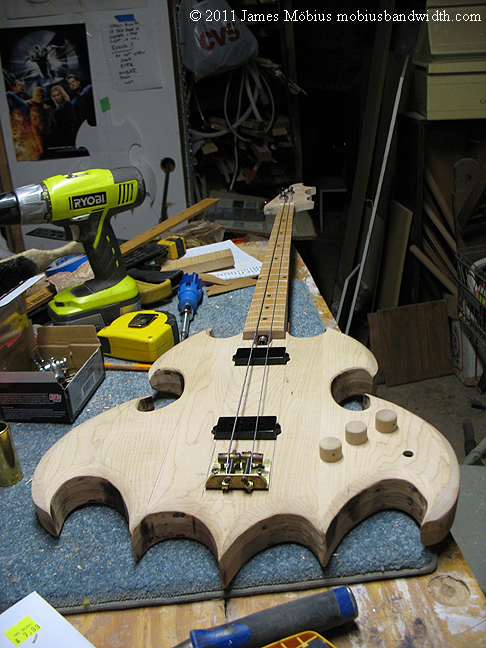 My first bass, I modified with Steve Cardoza, my 1st bass teacher's help, we ripped out the frets from the 12th up, so I could practice fretless playing, without giving up my frets altogether, an idea I got from Brian Fox who'd done that to his black Hagstrom. 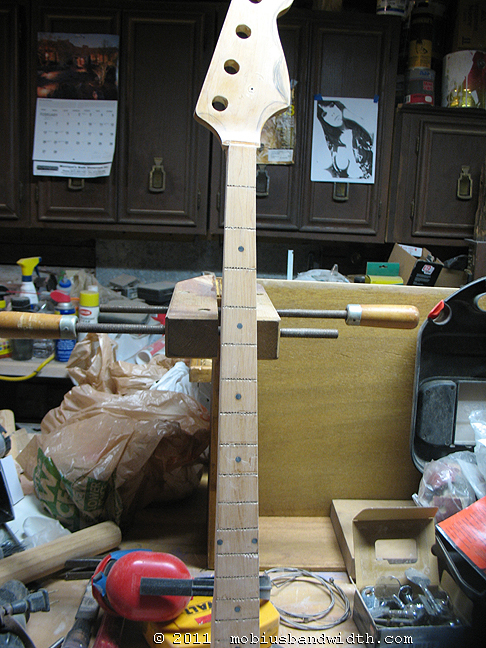 I epoxied and sanded the neck. 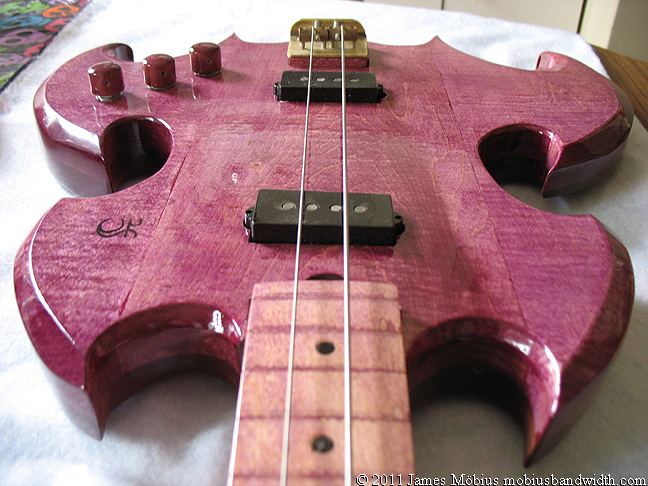 Not long after, I built my first bass, BadAxe, a red fretless 5 string bass, (it was originally a 4 string). 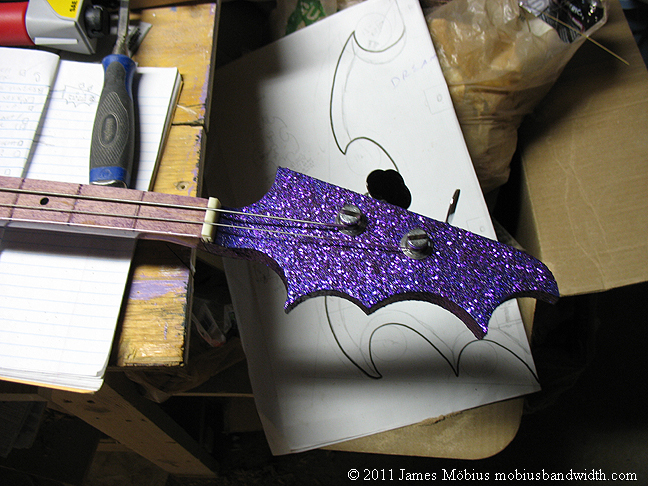 Ever since, I've enjoyed designing and modifying instruments. 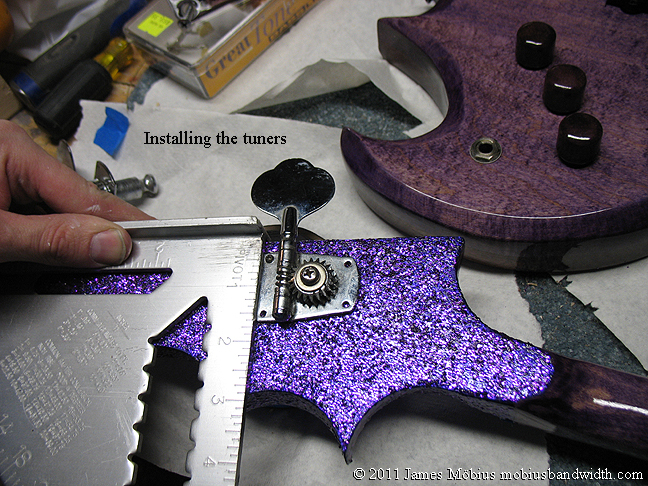 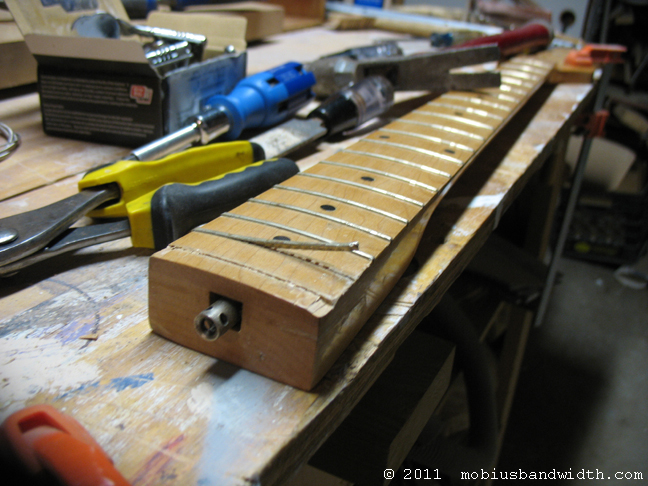 Initially I hired the repairman at Mr. Music to do my mods, but eventually started doing them myself. 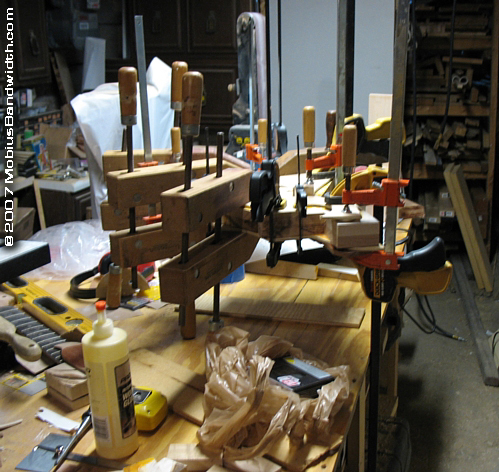 These included turning 6 stringed guitars into mandocellos, bouzoukis, (8 strings) tenor guitars (4 or 5 string) and I made a cittern (10 string) out of a 12 string guitar. 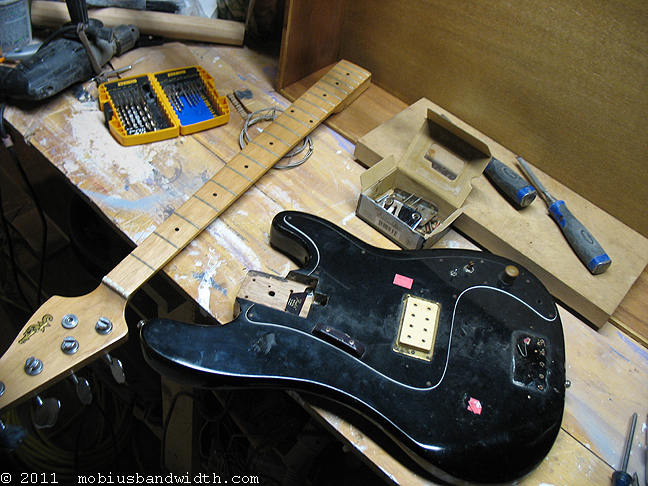 I've fixed a number of instruments for other people, as well as for myself, I did have a class at Berklee in guitar repair which was quite useful. 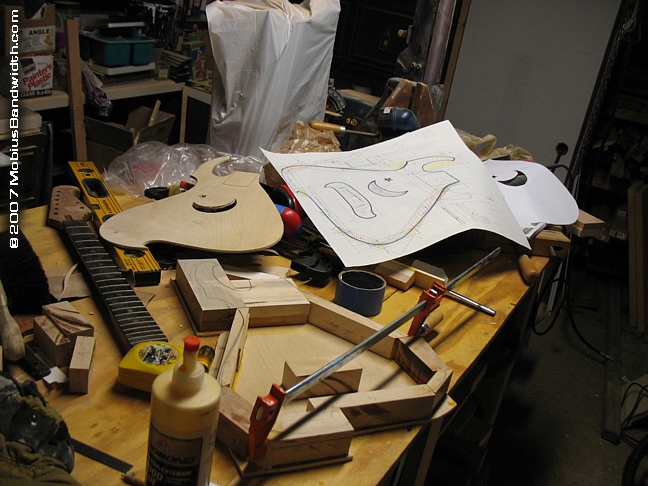 I plan on building a lot more instruments in the future. 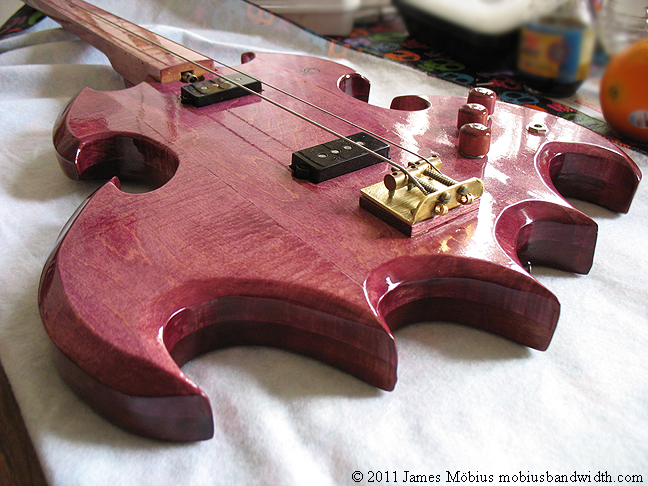 I have a design for a guitar I want to make, and a 6 stringed fretless bass. 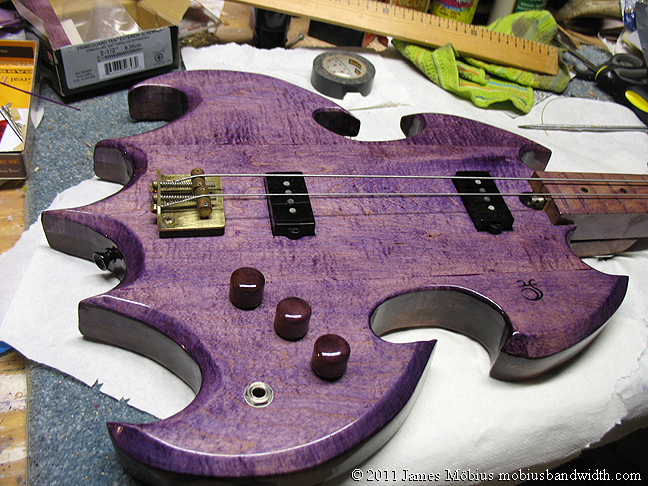 Probably another 5 string fretted bass as well. 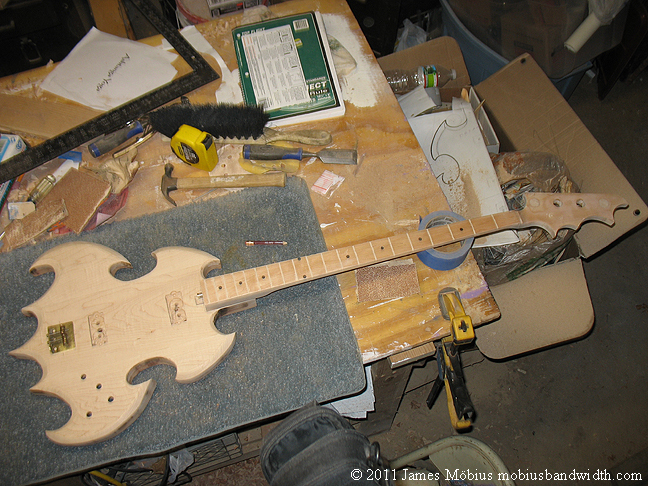 This is a Bouzouki I built, a traditional Greek folk instrument, favoured for the last few decades by Celtic musicians as well. 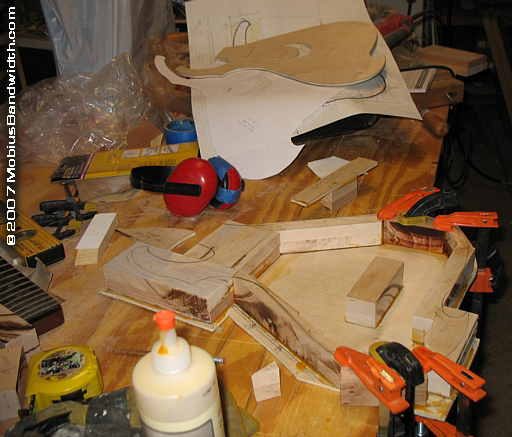 I have to remake the saddle. 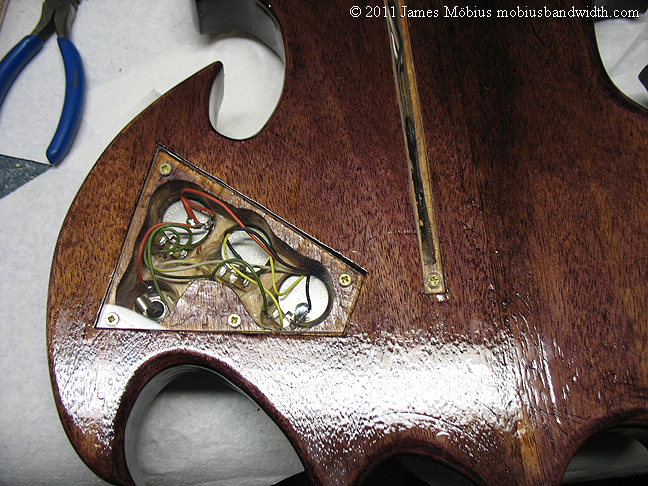 I used rather non-orthodox luthiery techniques, I was after a natty "rubber bands on a cigar box" sort of tone, and I achieved that. 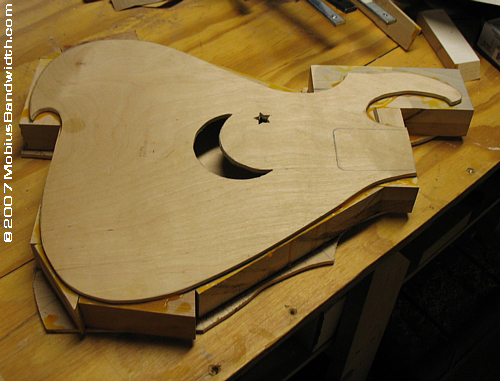 The body of a Bouzouki is normally tear drop shaped, but I designed my own, including the moon and star sound holes, because that's how I roll. 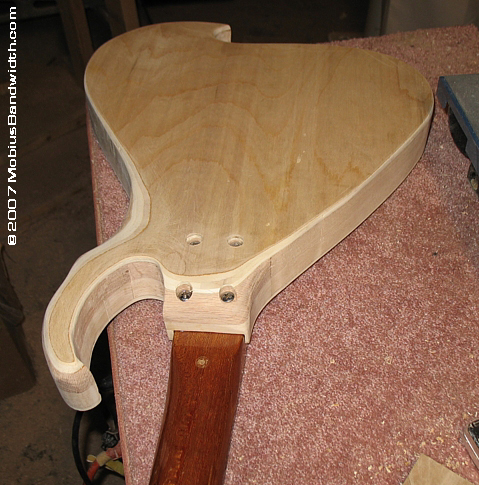 The neck on this instrument was originally a guitar neck which I think came off a cheap guitar someone gave me, my only expense was buying 8 tuning pegs. 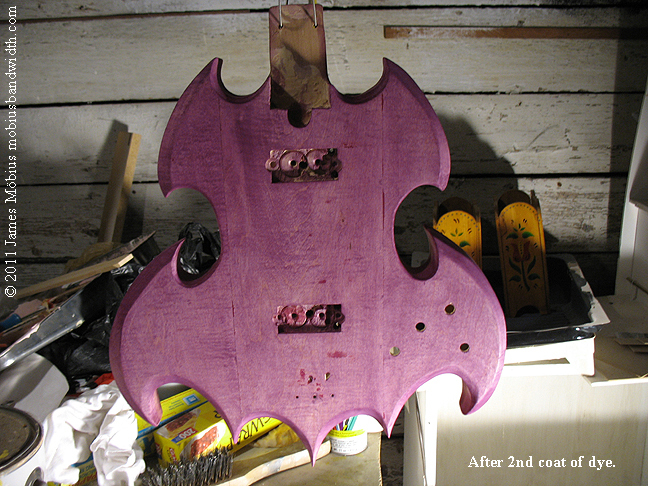 the rest was made of recycled and leftover wood. 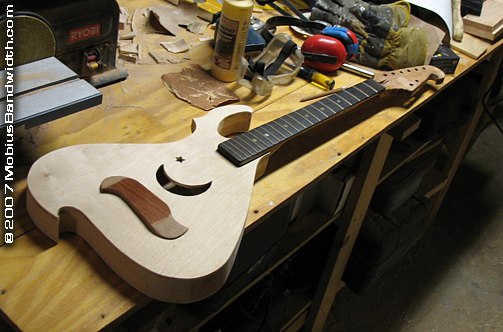 This is a 3 stringed fretless guitar, which I like to call a Cellolaika, it's sort of like a cello, it's bowed, with a very rounded radius to the fingerboard, but has 3 strings like a Balalaika. 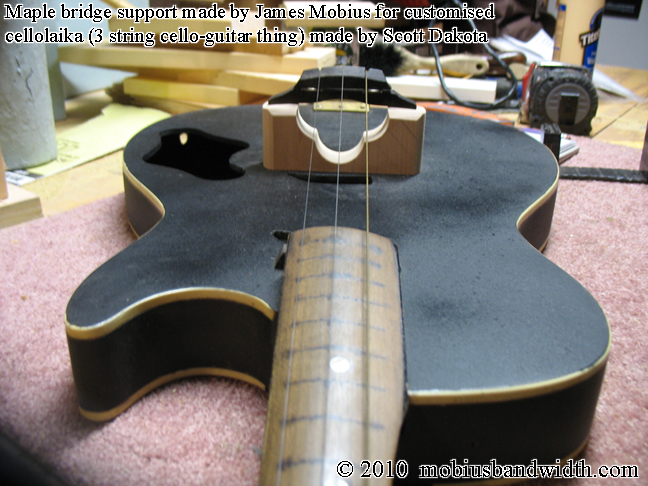 It was a guitar, modified by Scott Dakota, I built a new bridge support for it with a clover motif, out of a hunk of maple, the original one was lego, which worked but I thought this might have a better tone and offered to mill it for the instrument's owner, Sharynne NicMhacha. 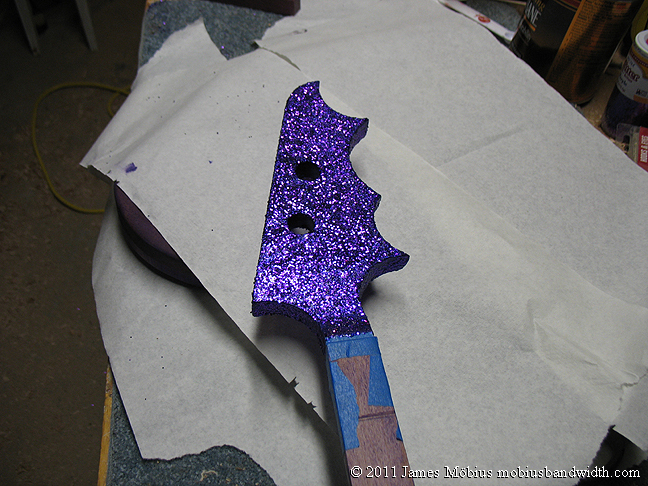 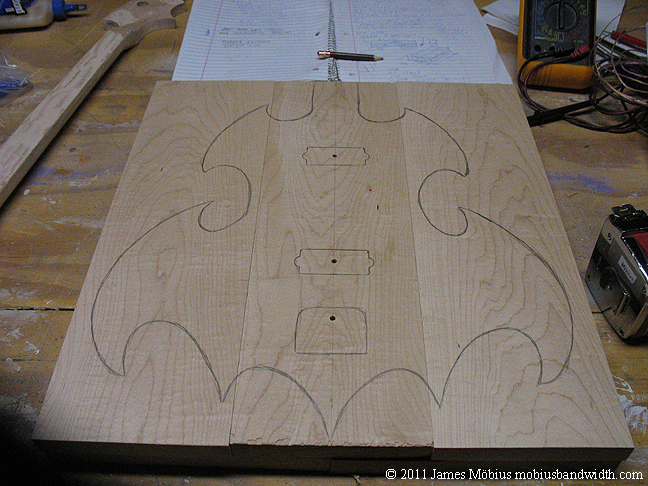 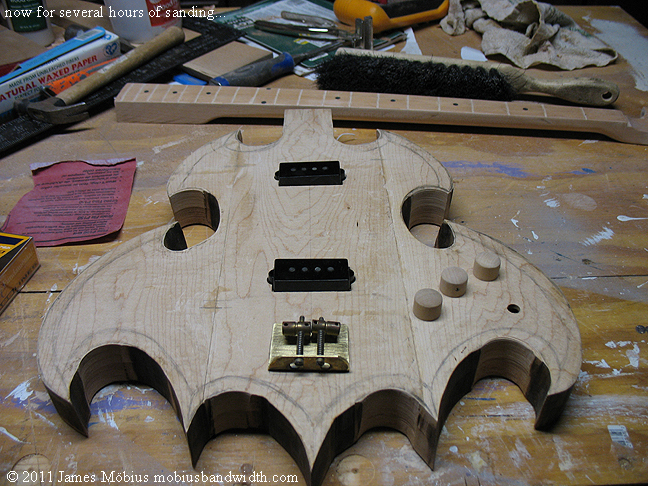 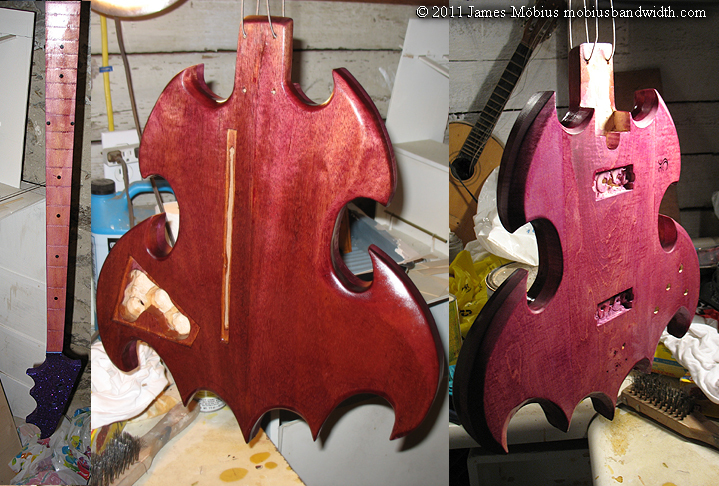 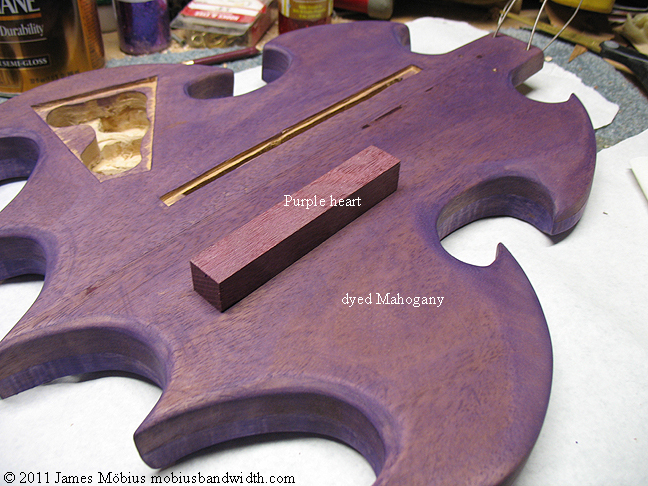 This is a project I'm working on now, (2/11-) I call it the Bat Bass. 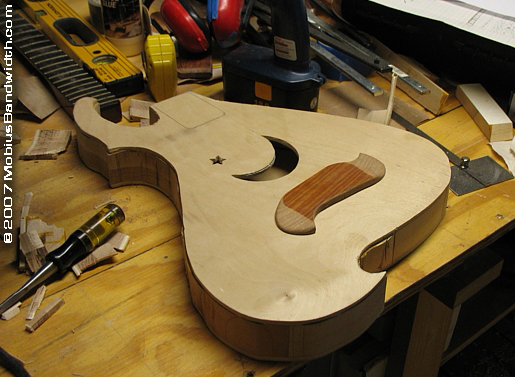 I bought a used 4 string bass in a thrift store for $60, it looked rather forlorn, with only 2 strings on it, but I am going to make it into a Mark Sandman-style 2 string slide bass anyway. 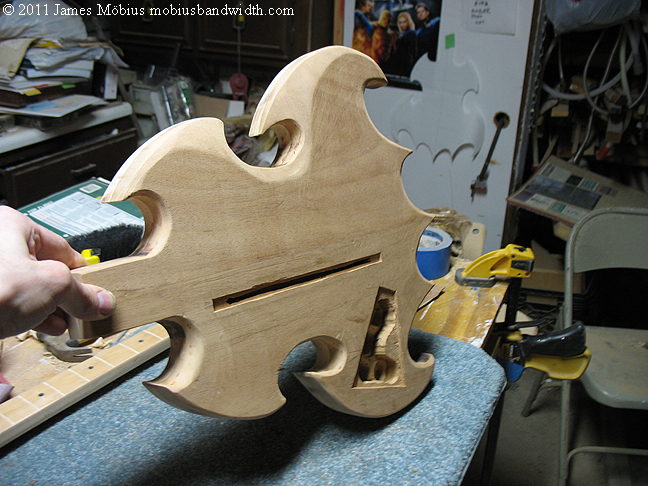 It called out to me, and on an impulse I took it home. 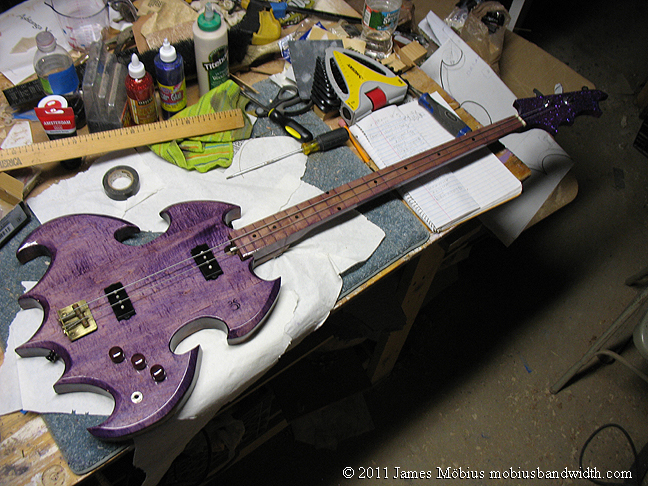 I have been wanting to make a slide bass for quite a while. 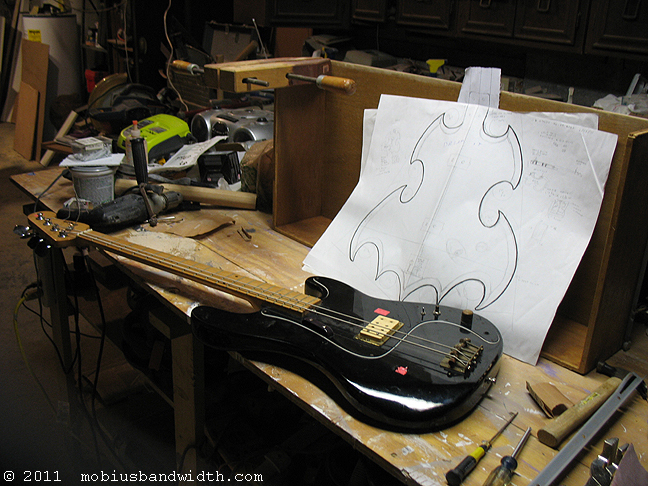 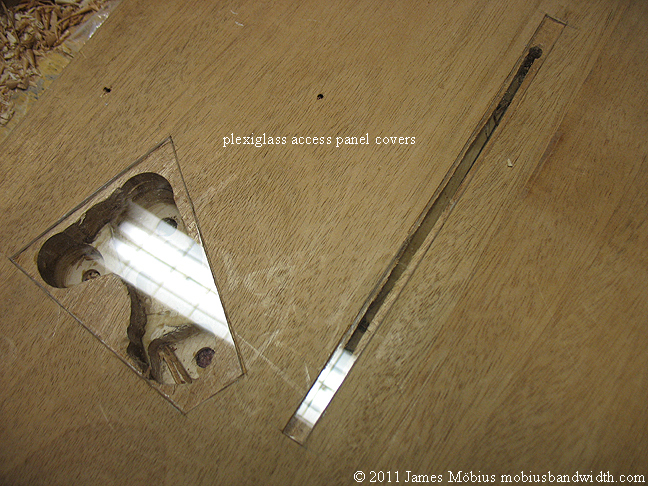 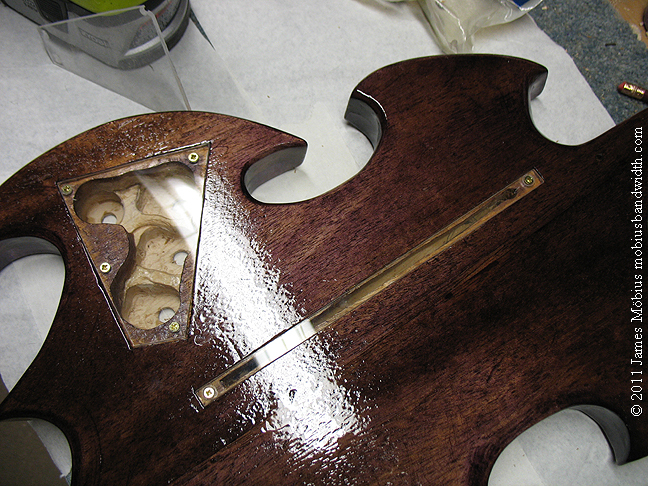 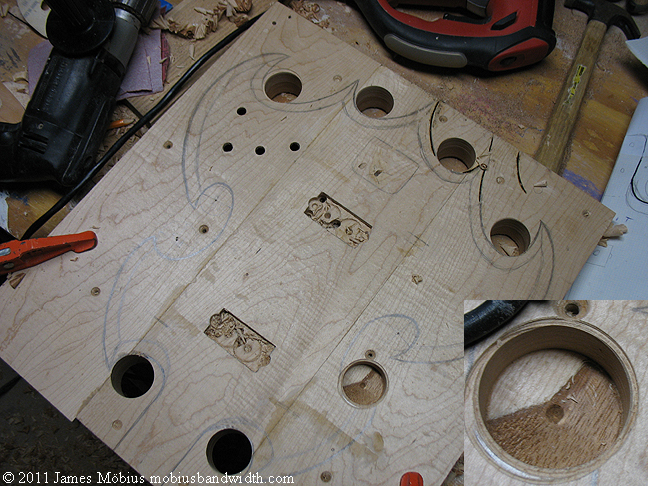 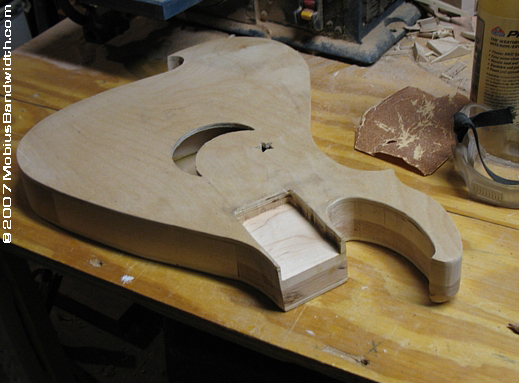 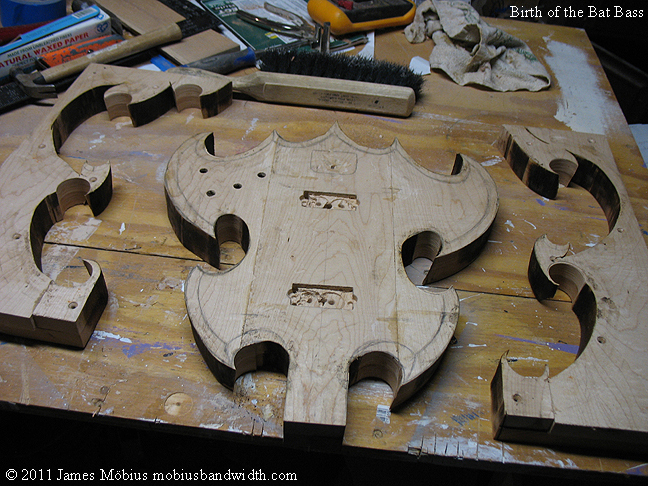 Below are a few photos of various phases of construction, I've made a page which goes into great detail about the building of this bass, with lots more photos, which you can access by clicking here. 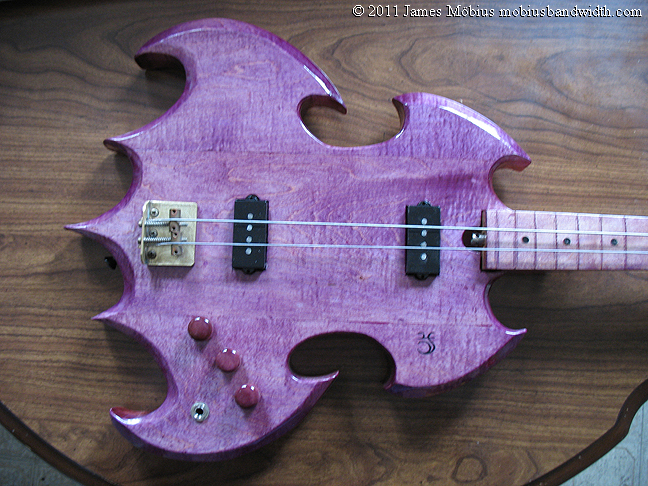 Here is a little demo video to get an idea how the Bat bass sounds, music is a medley of Mark Sandman basslines, I'm still figuring them out, so they're not perfect.